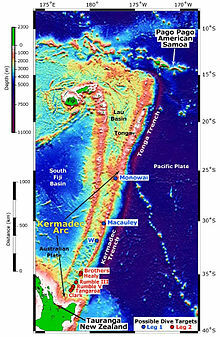 The Tonga Trench is an oceanic trench located in the south-west Pacific Ocean. It is the deepest trench of the Southern Hemisphere and the second deepest on Earth. The fastest plate tectonic velocity on Earth occurs as the Pacific Plate is being subducted westward in the trench. At its northern end the Tonga Trench bends west into the microplates, interconnected spreading centres, and deformation zones of the Lau Basin. But the Tonga Trench also has a continuation in the inactive Vitiaz Trench (north of map area) with which it formed a single continuous trench before the opening of the North Fiji Basin (west of map area). The Capricorn Seamount (centre right) is sitting on the eastern slope of the trench. ^ "GEBCO Gazetteer of Undersea Feature Names". GEBCO. 26 April 2015. Retrieved 9 April 2017. Bevis, M.; Taylor, F. W.; Schutz, B. E.; Recy, J.; Isacks, B. L.; Helu, S.; Singh, R.; Kendrick, E.; Stowell, J.; Taylor, B.; Calmant, S. (1995). "Geodetic observations of very rapid convergence and back-arc extension at the Tonga arc". Nature. 374 (6519): 249–251. Bibcode: 1995Natur.374..249B. doi: 10.1038/374249a0. Retrieved 9 April 2017. Bird, P. (2003). "An updated digital model of plate boundaries". Geochemistry, Geophysics, Geosystems. 4 (3): 1027. Bibcode: 2003GGG.....4.1027B. CiteSeerX 10.1.1.695.1640. doi: 10.1029/2001GC000252. Contreras‐Reyes, E.; Grevemeyer, I.; Watts, A. B.; Flueh, E. R.; Peirce, C.; Moeller, S.; Papenberg, C. (2011). "Deep seismic structure of the Tonga subduction zone: Implications for mantle hydration, tectonic erosion, and arc magmatism". Journal of Geophysical Research: Solid Earth. 116 (B10): B10103. Bibcode: 2011JGRB..11610103C. CiteSeerX 10.1.1.725.500. doi: 10.1029/2011JB008434. Garcia-Castellanos, D.; Torne, M.; Fernandez, M. (2000). "Slab pull effects from a flexural analysis of the Tonga and Kermadec Trenches (Pacific Plate)" (PDF). Geophysical Journal International. 141 (2): 479–484. Bibcode: 2000GeoJI.141..479G. doi: 10.1046/j.1365-246x.2000.00096.x. Retrieved 9 April 2017. German, C. R.; Baker, E. T.; Connelly, D. P.; Lupton, J. E.; Resing, J.; Prien, R. D.; Walker, S. L.; Edmonds, H. N.; Langmuir, C. H. (2006). "Hydrothermal exploration of the Fonualei Rift and spreading center and the Northeast Lau spreading center". Geochemistry, Geophysics, Geosystems. 7 (11): Q11022. Bibcode: 2006GGG.....711022G. CiteSeerX 10.1.1.846.412. doi: 10.1029/2006GC001324. Furlong, R. R.; Wahlquist, E. J. (1999). "US space missions using radioisotope power systems" (PDF). Nuclear News. 42: 26–35. Retrieved 9 April 2017. Hill, P. J.; Glasby, G. P. (1996). "Capricorn Seamount – geology and geophysics of a subducting guyot,". In Meylan, M. A.; Glasby, G. P. (eds.). Manihiki Plateau, Machias and Capricorn Seamounts, Niue, and Tofua Trough: Results of Tui Cruises (PDF). SOPAC Technical Bulletin (Report). 10. pp. 17–29. Archived from the original (PDF) on 2017-04-15. Retrieved 14 April 2017. Leduc, D.; Rowden, A. A.; Glud, R. N.; Wenzhöfer, F.; Kitazato, H.; Clark, M. R. (2016). "Comparison between infaunal communities of the deep floor and edge of the Tonga Trench: Possible effects of differences in organic matter supply" (PDF). Deep Sea Research Part I: Oceanographic Research Papers. 116: 264–275. Bibcode: 2016DSRI..116..264L. doi: 10.1016/j.dsr.2015.11.003. Retrieved 17 April 2017. Peirce, C.; Watts, T. (2010). "Post-Doctoral Researchers in Marine Geophysics Further Particulars". Durham University/University of Oxford. CiteSeerX 10.1.1.619.2915. Richards, S.; Holm, R.; Barber, G. (2011). "When slabs collide: A tectonic assessment of deep earthquakes in the Tonga-Vanuatu region". Geology. 39 (8): 787–790. Bibcode: 2011Geo....39..787R. doi: 10.1130/G31937.1. Retrieved 24 December 2016. Smith, I. E.; Price, R. C. (2006). "The Tonga–Kermadec arc and Havre–Lau back-arc system: their role in the development of tectonic and magmatic models for the western Pacific". Journal of Volcanology and Geothermal Research. 156 (3): 315–331. Bibcode: 2006JVGR..156..315S. doi: 10.1016/j.jvolgeores.2006.03.006. Retrieved 19 March 2017. Smith, I. E.; Worthington, T. J.; Stewart, R. B.; Price, R. C.; Gamble, J. A. (2003). "Felsic volcanism in the Kermadec arc, SW Pacific: crustal recycling in an oceanic setting". Geological Society, London, Special Publications. 219 (1): 99–118. Bibcode: 2003GSLSP.219...99S. CiteSeerX 10.1.1.972.7814. doi: 10.1144/GSL.SP.2003.219.01.05. Stratford, W.; Peirce, C.; Paulatto, M.; Funnell, M.; Watts, A. B.; Grevemeyer, I.; Bassett, D. (2015). "Seismic velocity structure and deformation due to the collision of the Louisville Ridge with the Tonga-Kermadec Trench" (PDF). Geophysical Journal International. 200 (3): 1503–1522. Bibcode: 2015GeoJI.200.1503S. doi: 10.1093/gji/ggu475. Archived from the original (PDF) on 26 October 2015. Retrieved 16 April 2017. Worthington, Tim J.; Hekinian, Roger; Stoffers, Peter; Kuhn, Thomas; Hauff, Folkmar (30 May 2006). "Osbourn Trough: Structure, geochemistry and implications of a mid-Cretaceous paleospreading ridge in the South Pacific". Earth and Planetary Science Letters. 245 (3–4): 685–701. Bibcode: 2006E&PSL.245..685W. doi: 10.1016/j.epsl.2006.03.018. Retrieved 17 December 2016. Wright, D. J.; Bloomer, S. H.; MacLeod, C. J.; Taylor, B.; Goodliffe, A. M. (2000). "Bathymetry of the Tonga Trench and Forearc: A Map Series" (PDF). Marine Geophysical Researches. 21 (5): 489–512. Bibcode: 2000MarGR..21..489W. doi: 10.1023/A:1026514914220. Retrieved 9 April 2017.